As time moves on, more and more knife makers are making the switch from traditional washers to ball bearings systems, and Ganzo is no exception. The budget Chinese knife maker is a bit late to the party with their first ball bearing flipper knife, the G7522. Among the low budget competition it is, however, a well executed, smooth, and lightweight jack of all trades EDC blade that still just might leave some of the more passionate knife enthusiasts feeling a bit cool. The Ganzo G7522 is a full-size EDC pocket knife with a 3.5 inch stone washed drop point blade. It features a stainless steel frame lock design with G-10 back spacer and overlays, a lanyard hole, a ball bearing action actuated by a flipper tab or ambidextrous thumb studs, and blue hardware including screws thumb studs and pivot. Rounding out the package is a deep carry pocket clip that may be mounted tip up or tip down right side only. Normally a steel frame lock knife of this size would weigh in at 6 or more ounces. However, Ganzo has milled lightening holes and recesses for mounting the flush fitting G10 overlays to the steel scales and added a fuller to the blade. All of this skeletonization allows the G7522 to weigh in at 4.75 ounces. It’s still not a feather weight knife, but is surprisingly light when you pick it up the first time. The long, sweeping lines of the knife are of a modern minimalist style with with few sharp angles, and just enough flare to keep the simple styling cues interesting. While I do not think this is the most handsome knife on the market, it is far from an eye sore. Some will find the G7522 underwhelming, but it will likely offend very few. The blade on the Ganzo G7522 is a 3.5 inch stone washed drop point with a prominent fuller and blue thumb studs. The blade features a long flowing belly that blends well into the other aesthetics of the knife. The tip is fairly acute with the drop point and shallow belly meeting at a moderately tapered tip. This is a middle of the road blade shape, doing slicing and piercing tasks well but excelling at neither. The tip is fine enough for most finer tasks but has plenty of steal so as to avoid being overly delicate. The 440C steel blade and came reasonably sharp out of box. The edge shaved arm hair with relative ease, and after several weeks of medium duty use is still capable of taking off hair with notably less comfort. Once a ‘super steel’ in its day, 440C is now a decent budget steel, retaining its edge slightly longer than the AUS-8 or 8Cr13MoV steels found on most other knives at this price point. Despite the worthy performance in edge retention, I did manage to chip the blade near the tip. As with all my budget knives, my use at times can border on minor abuse. I cannot say exactly when I chipped the blade, but at one point I did opened a box with large staples which was likely the culprit. Blame me or blame the steel, but it was not a smart or careful thing to do with any cutting tool. Sharpening is easy with the G7522. The 440C steel does not put up a fight, so combined with the sharpening choil and smoothly sweeping belly this knife is a joy to work with on a traditional wet stone. I was also able to attach my clamp style constant angle sharpening system to the flat of the blade. However, the flat is broke by the fuller which eats up much of the real estate your sharpening clamp would hold onto. The sharpener did stay, but it felt less sturdy than on knives with a proper flat. In hand the G7522 is quite comfortable and grippy. As a knife enthusiast I tend to enjoy busy handles, the ones that bristle with finger groves and angled bits that fill the hand perfectly. The G7522 takes a much simpler path to good ergonomics with the subtle curves mentioned above. No matter how you hold the G7522 it feels comfortable in hand. Forward, reverse, and saber grips all feel equally natural. Ganzo sandwiches the handles in medium grip small brick G10 slabs, and a back spacer featuring reliefs cuts. The notched back spacer is not abrasive to the hand, but clearly does adds grip compared to the section of scales after it stops. As an added bonus the G10 slabs act as over travel stops for the frame lock. It is a slick way to add this functionality with out additional cost or complication. The blade features a thumb ramp covered in well executed jimping. In the past Ganzo’s jimping was often too rounded to be truly effective, here they have stepped up the aggressiveness a few notches. The ridges grab the thumb with just enough traction while avoiding being overly harsh or abusive. My one complaint is that the pocket clip makes for a minor hot spot. This is a fairy standard low ride clip, similar to clips found on other brands of knives. The shape of this type of clip has not generally been an issue with other knives. The problem here is how thin and straight the scales are; it just leaves the clip slightly more exposed than on other scales. Deployment is very consistent with both the thumb studs and the flipper tab, and after several weeks of use the lock up is at 60%. The knife has no preference between light switch and push button activation. In fact, if you break the detent it is almost impossible to not get a full deployment. The consistent smooth deployment is a sign of a quality bearing system. Because of the extensive milling and G10 overlays the knife opens with a twang. Other reviewers have found this to be less than pleasurable, however mine sounds just like the wood block musical instrument and it puts an impish smile on my face. Folding the blade is quite utilitarian. After the lock bar is disengaged, the blade slumps down until the detent catches the tang of the blade. Here it waits like a well trained dog, giving you a moment to move your thumb out of the path of travel. After your thumb is safely out of the way a simple light shake makes the blade fall shut under its own weight. For an EDC knife this is tuned perfectly smoothly and quick but still safe. The lock bar was easy to disengage, and I never caught my finger between the lock bar and G10 liners. However, many other reviewers have run into this problem though, so I am mentioning it here as I might be the statistical outlier. The G7522 has good pocket manners, and for a large blade they border on the exceptional. The thin, lowish weight knife all but disappears into the pocket. The low ride pocket clip and slim tail make for discrete carry, barely hinting at the full size knife hiding within. The quality pocket clip combined with the medium grip G10 allow for smooth non-damaging insertion and retrieval from the pocket. As a bonus there are no sharp edges to catch the hand on as you retrieve other items from your pocket. To be fair, ball bearings do require more maintenance than traditional washer systems. Debris can and will get into the bearing runs and even one tiny piece of detritus can make for gritty deployment. I often use my knife in a setting complete with saw dust and metal shavings, and although I seldom have this problem with any of my bearing knives it never happens with my washer knives. If you are going to hard use a knife in a particularly dirty job, or in a situation where you are unable to perform maintenance on your tools, this is a factor to keep in mind when selecting a knife. The overall fit and finish on the Ganzo G7522 is pretty good for a $20 knife. The parts all fit together tightly; the corners are chamfered well; the colors and finish are uniform; it is just a good-looking work of machining. In fact, the lock bar cut out gap is cut paper thin. Ganzo uses Wire EDM technology to make a cut slimmer than a baseball card. It makes for a nice touch not even found on many upscale knives. Stonewash is not my favorite knife finish, but here it has a beautiful luster to it. I can only imagine that Ganzo polished the scales and blade before applying the stonewash. Alas, this knife is not without its flaws in the fit and finish department. The pocket clip is not seated completely flush with its G10 cut. The front edge of the screw base is ever so slightly pushed up onto the G10 scales. It does not affect how the knife pockets but its there for the careful eye to spot. Blade centering also favors the presentation side. There is no contact with the scales, and deployment is not affected in the least. Both of these are strictly cosmetic issues, but when cramming this many features into the $20 price point something had to give. So what else is out there competing for your hard earned dollar in this budget price bracket? Ontario Rat 1 (~$25) – The Rat is the most direct comparison I can make to the G7522. Both are large EDC blades with long straight(ish) blades and handles. The action on the Rat keeps up with the G7522, but it runs on washers (not a small feat). If you are really going to hard use a knife in a dirty environment washers are the way to go. If you are less demanding of your cutting tools this question becomes much more interesting. Kershaw CQC-6K 6034 (~$25) – The CQC-6K is another knife similar in form to the G7522, however it runs on Teflon washers that never feel as smooth as bronze washers or bearings The wave function here allows for instant deployment out of the pocket, so if your first priority is self defense the 6K is the obvious choice. After that the knife is heaver, with a worse standard deployment and similarly excellent ergonomics. CRKT Outrage (~$35) – The Outrage is again very similar in features to the G7522 in that it is a full size knife running on ball bearings with overlays and steel liners. The difference here is that the lines of the Outrage speak to me as a knife enthusiast in a way the G7522 never will. I like everything about the G7522: its fine in pocket, works well in most every situation but I never get exited to put it in my pocket. The Outrage on the other hand makes me want to drag it out and show everyone. Its to heavy for what it is, and it lacks any real grip in hand, but the knife nut in me loves this thing. Ganzo G742-1-BKP (~$15) – In many ways the G741/G742 models (themselves a copy of the LionSteel DPx HEST F2.0) are the predecessors to the G7522. They come in several combinations of locks and scales. The G742-1-BKP is in my opinion the best of the bunch, with a single sculpted G10 scale providing gobs of stick in the hand, a tough as nails frame lock, and a more pronounced belly making for better slicing. However, it is notably heavier and less ergonomic in hand. The G7522 is a few dollars more expensive, but is hands down a better knife for all but the hardest of use. The subtle re-profiling of the handle between the G742 and G7522 has left the newer model much more ergonomic and better in pocket. 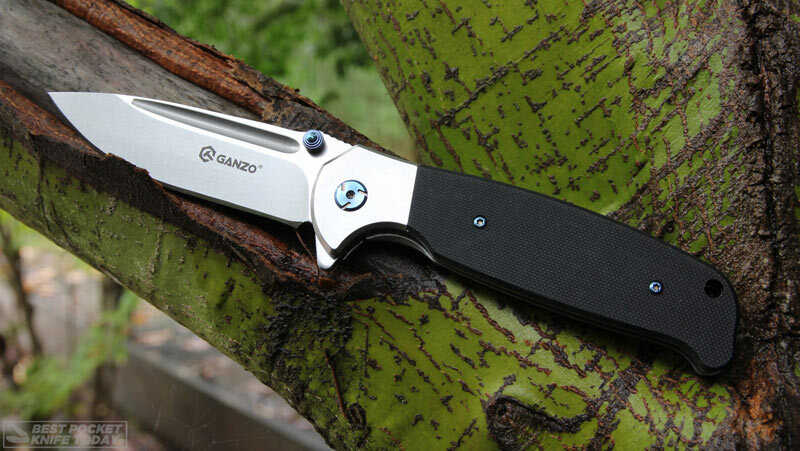 Ganzo G749 (~$20) – This model has essentially the sister model to the G7522, boasting the same features but with more angular and aggressive lines. Plus an extra pattern milled into the G10 for added grip. The differences are mostly visual, but it just works as a whole and does “it” for me as a knife enthusiast. The Ganzo G7522 is a good full size low budget EDC knife with a ton of features for only $20. It carries and deploys well, performs adequately and offends few. Still, in a market filled with great budget options it just lacks any ‘wow’ factor. I have enjoyed using it these past few weeks, but now that I am back to carrying other knives I do not miss it. Despite the laundry list of great features, ultimately this a knife that just does not speak to the soul. If you have a fire in your belly for your cutting tools or if you want to fall in love with your pocket knife every time you pull it from your pocket, there might be other blades out there that will scratch this itch in ways this blade just cant. Ganzo is doing an awful lot of good things here, but in the end this one one is just slightly less than the sum of its parts. Jack of all trades but master of none. Somewhat underwhelming. 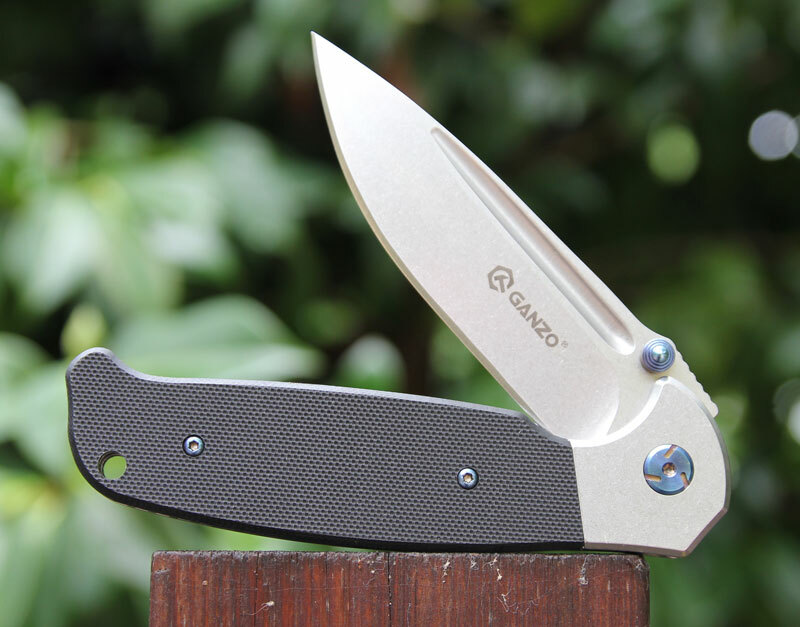 The G7522 is a step in the right direction for Ganzo but still lacks any long lasting appeal. An 'okay' EDC blade for the budget conscious but better options exist. Review by Seth Gunn – Seth has been an avid knife enthusiast for more years than he can remember, with a passion for modern folding knives.